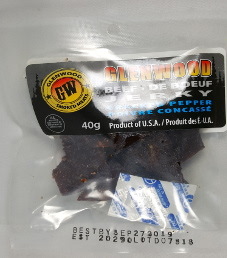 The first review for Glenwood Smoked Meats will focus on a 1.4 ounce/40 gram bag of their cracked pepper beef jerky. This flavor is simply advertised as good old fashion peppered jerky made with 100% beef. The bag was purchased at a 7-Eleven store in Brampton, Ontario.